Size of this PNG preview of this SVG file: 638 × 600 pixels. Other resolutions: 255 × 240 pixels | 511 × 480 pixels | 817 × 768 pixels | 1,089 × 1,024 pixels | 668 × 628 pixels. English: This picture describes when you can ignore the rules. Source Own work, created using Gliffy. Author Original concept by Petrb, cleaned up by User:Scott. 22:16, 17 May 2016 668 × 628 (25 KB) Ahecht Common sense should be the first test, not the last. Otherwise, the diagram advocates doing anything as long as it doesn't break the rules. 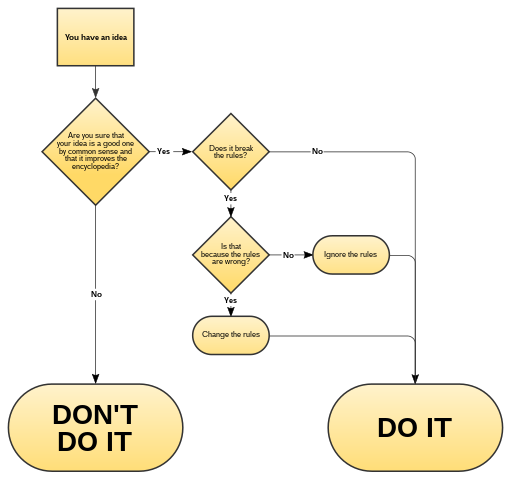 12:49, 28 April 2014 668 × 516 (36 KB) Scott Messy flowcharts make me a sad panda. Created using [http://gliffy.com/ Gliffy].